I just saw this post on Twitter by House Beautiful and I just love this idea. Illuminating the outdoors, who would have though about doing this with tree stumps? So it seems Duncan Meerding, a Tasmania-based furniture and lighting designer thought this was pretty cool and they’re right. 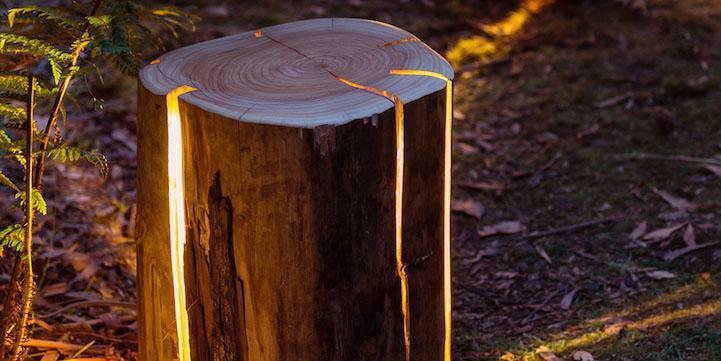 They are transforming naturally cracked tree stumps into lamps. Duncan’s work celebrates nature. According to My Modern Met, these lamps are made from salvaged wood. Duncan, who is legally blind, embraces their natural cracks in the wood by inserting warm yellow LED lights inside them to create the lamps. I just happen to have some stumps in the yard that I was going to take out…but now I am giving that a second thought, thinking…hmmm…maybe I should light them up, talk about a conversation piece.